As the US goes through one of its periodic paroxysms over how the small minority of high school graduates who attend a selective four-year undergraduate college is chosen, it's worth taking a moment to remember everyone else. US high schools graduate about 3.6 million students each year. That's a big group, with a wide array of abilities, preparation, and interests. For a substantial number of them, high school was not an especially rewarding academic experience, and no matter what they are told by their college-educated teachers and college-educated counselors, the idea of signing up for a few more years of academic courses is not very enticing. Oren Cass has written a short essay about this group, "How the Other Half Learns: Reorienting an Education System That Fails Most Students" (Manhattan Institute, August 2018). Here are a couple of points that caught my eye. One study looked back at the students who graduated from high school in 2003, and how the education system had treated them six years later. The data is obviously a few years old, but the overall patterns don't seem to have changed much. For example, about 70% of high school grads enrolled in college in 2003, and about 70% did so in 2016, too. Of the 70% who started off to college in 2003, about two-thirds went to a four-year school and one-third to a two years school. 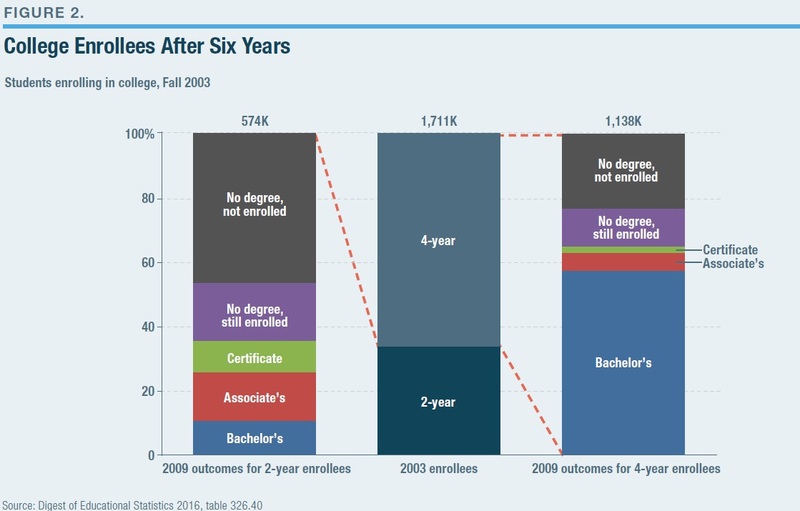 Six years later, by 2009, fewer than half of those who started off to college in 2003 had a degree. Only 16 will successfully navigate the high school to college to career pipeline—the current aim of the education system. Of course, these problems are fairly well-known. I've written here about "The Problem of College Completion Rates" (June 29, 2018), and about "Some Proposals for Improving Work, Wages and Skills for Americans" (February 19, 2019) like a dramatic expansion of community colleges. But my sense is that the issue here runs deeper. Cass offers one way of thinking about alternatives. Of course, this alternative track does require students to make some choices in about 11th grade, but frankly, that doesn't worry me too much. By 10th grade, a lot of students have a fairly good grip on where they stand academically. And if a student chooses a career and technical education track, but decides after a couple of years to give college a try, that's of course just fine. The bigger hurdle, it seems to me, is that the alternative vision requires a group of employers who are willing to restructure their organizations in a way that will enable a steady stream of 18-20 year-olds to enter a subsidized work program every year. Moreover, these employers need to treat these young workers not just as an unskilled pair of hands, but to think about what kinds of training and certification these young workers should be attaining during this time. Most US employers are not used to thinking of themselves in these roles. But it seems to me that a substantial share of the 3.6 million high school graduates each year might prefer something like Cass's "alternative pathway" to a four-year college degree. As the figure illustrates, society would not be investing less in these young adults--it would just be investing differently. Like a lot of people who ended up working in academia, I went off to college eager and enthusiastic about doing things like reading Adam Smith and Plato, and writing papers about topics like the international law ramifications of the UK-Icelandic cod fishery disputes of the 1970s. But I have noticed over time that not everyone shares my enthusiasms. The US needs alternative paths to good jobs at good wages that don't just involve telling all of the 3.6 million high school graduates they need to keep going to school.